If you would like to book a function at one of King Street Wharf’s awesome venues, check out the info below and get in touch! If there’s one place you can count on for a memorable function in a vibrant, lively atmosphere, it’s Beer DeLuxe. Their professional team is ready to work with you to ensure every little detail is just so. With a diverse range of food and a choice of function spaces, Beer Deluxe caters to all budgets from informal gatherings to lavish gala dinners. Beer DeLuxe offer upstairs, courtyard and full venue bookings. You can learn more here. If you’re after a VIP experience with wow-factor, Bungalow 8’s balcony on level one can be booked ahead. 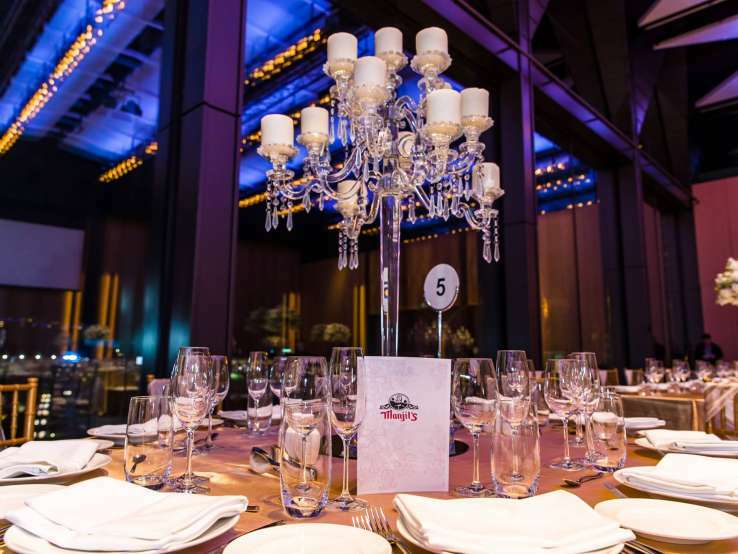 Stunning views of Darling Harbour will set the scene for a truly memorable event. Enough said. Make an impression with an event at Cargo. This two-level party destination with waterfront views is the perfect place to host any social occasion. To start planning your event download their function pack here. Casa knows how to throw a party! With a seated capacity of 350 and standing capacity of 500, Casa can cater to all your nearest and dearest in true Italian style. Casa’s exclusive Private Dining Room allows up to 45 seated guests or 70 standing guests. With its luxurious furnishings, food and beverage, it’s an exclusive choice for your next celebration. Exclusive full venue hire, canapé parties, weddings, hen’s nights, birthdays, client meetings, private dinners, corporate lunches, professional workshops, you name it, you’ll find it at Casa. Georges Mediterranean Bar & Grill brings the flavours and joy of the Mediterranean to the waterfront at King Street Wharf. Georges’ lounge area can be transformed into your dream space. Whether an intimate gathering or a large cocktail event, your guests will have plenty of room to relax and take in those harbour views. Will you choose canapés? Or will it be a delicious banquet to bring a unique Mediterranean feel to your function? So many choices! Georges has multiple indoor and outdoor dining areas that can be joined together for larger groups. Enjoy a fine selection of local and imported wines matched to your menu. Need room to make a statement? Hire Georges venue exclusively. Start with welcome drinks in the Grove Bar where your guests can mingle and enjoy floating cocktails and canapés. Then continue through to the Dining Area for a formal sit-down experience. Or, if your guest list is long enough, merge the lounge and dining areas for the ultimate cocktail party. Whatever your needs, you’ll find this page will help you decide. Whether you’re planning a corporate lunch, family dinner, cocktail party, social get-together or a one-off extravaganza, the staff at Kobe Jones are ready to advise, inspire and collaborate with you to create something unique and memorable. The restaurant layout is flexible and ready to be adapted to your specific needs. Business or pleasure, you’ll find just the right setting with a menu that tickles all the right tastebuds. Head to this page to bring your function to life. The Malaya offers many function options, and can cater to groups as large as 282 people. If your picture of a perfect event is sharing from a spectacular banquet served to the middle of the table, The Malaya’s set menus are hard to beat. Want something more personalised? Dishes from the à la carte or live seafood menus can be prearranged. The Malaya also offers 3 hour beverage packages for groups of 18 or more people. Remember to preselect wines for your group at the time of booking (minimum 1 week prior to guarantee your selection). The Malaya offers a scrumptious dessert supplement with set menus for just $10 per person. They also serve a selection of small desserts and petit fours. Desserts are subject to availability so if you have your heart set on a favourite, it never hurts to pre-order. For over 30 years, Manjit’s has been a pioneer in Australian catering. From intimate dinners and small parties to grand weddings and gala events, every event is a flawless success. Sourcing the finest and freshest produce both nationally and internationally, they will customise a special menu for your event. With plentiful options to tantalise tastebuds from their Indian and Western banquet menus, your function is in good hands. Whatever your occasion, Manjit’s will make it a celebration. Find out more here. With a hands-on and creative Events team, Meat District Co. help to turn any celebration into ‘the’ celebration of the year. Decorations, exclusive use, canapé parties, hens, birthdays, client meetings, private dinners, corporate lunches… you name it, they’ve done it at Meat District Co. They can seat 220 and stretch this to 250 for a cocktail style function. For more information, get in touch via this page. With a large open plan, Nick’s Bar & Grill has the ability to host groups of up to 550 people for a sit-down dinner or a cocktail function of up to 1,200 people. They also have the ability to impress. A professional team of Chefs combined with a dedicated Functions Team means Nick’s has the know-how to create an event that will be spoken about for years to come. They pride themselves on flexibility and professional service from the first point of contact until the last guest departs. More on what Nick’s can do for your function can be found here. Alfresco dining at its best. 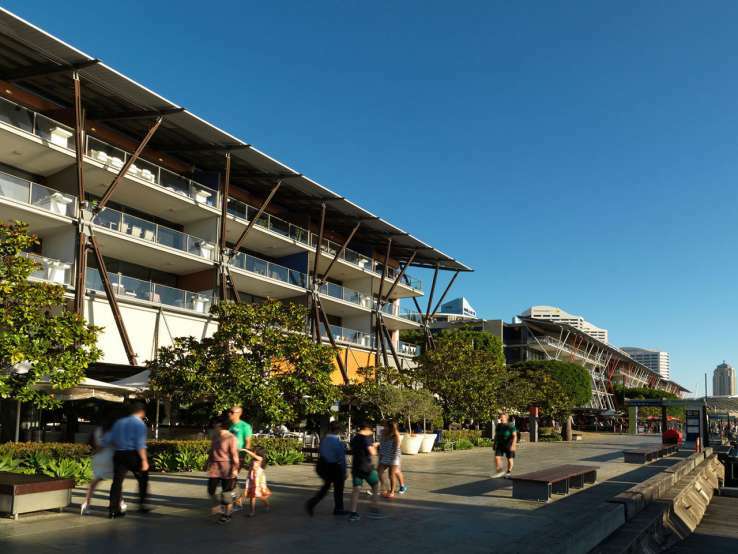 Enjoy a semi-private area on the balcony overlooking the stunning Darling Harbour. This King Street Wharf treasure provides an ideal setting for entertaining groups of up to 18 of your favourite people. Every table at Steersons provides water views whether you’re seated on the balcony or inside. For groups of up to 40, those views continue into the venue along with impeccable service and quality ingredients. This space for groups of up to 120, offers the opportunity to create a cocktail area on the balcony and seated area inside. Steersons Steakhouse ensures an impressive experience your guests will never forget. Groups of more than 12 can access set menus and beverage package options along with additional services that may help make your occasion all the more special. Head to this page to send your function enquiry. With a state of the art microbrewery, Southern style comfort menu, unique event spaces and the best beer garden on the Wharf, All Hands Brewing House welcomes all. Fresh life has been injected into the site of the old King St Brewhouse. With seven function spaces, All Hands cater for groups of 20 – 1,000 guests. Beyond the expansive wharf-side beer garden, there is an Engine Room for beer tasting with views over the microbrewery and a Lower Deck which holds up to 350 standing or 140 seated. Whatever space you choose, it all makes for a very social event on Sydney’s King Street Wharf. Check out all seven spaces here.